In case you missed these stories on their original run, here are the Top 10 AANA stories of 2018. Based on the information provided to the Board, I once again want to assure you that our decision to bring Amendment 7 to the membership was well intentioned. Never did we perceive that our fellow members would see this action as an attempt to silence their voices, especially with so many channels for direct communication available to allow members to be heard by the Board without waiting until Annual Congress. While the member dialogue has been essential, impactful, and maybe even cathartic, I apologize for this misstep and the consternation it has caused. In response to the release of President Donald Trump’s proposed Fiscal Year 2019 budget, the AANA has grave concerns about its potential far-reaching impact on the nation’s nursing workforce. The president’s budget proposes significantly cutting the federal healthcare workforce and research programs under Title VIII of the Nurse Workforce Development Program, from $229 million to just $83 million, a decrease of 64 percent. “For more than 50 years, the programs supported under Title VIII have helped to build the supply and distribution of qualified nurses to meet our nation’s healthcare needs. Title VIII funding has also been critical to educating and training Certified Registered Nurse Anesthetists (CRNAs) who deliver more than 43 million anesthetics to patients each year in the United States, especially those living in rural and other medically underserved areas,” said AANA President Bruce Weiner, DNP, MSNA, CRNA. “Nurses supported through Title VIII programs go on to provide high-quality, evidence-based healthcare to patients in a variety of settings including hospitals, surgery centers, physicians’ office, long-term care facilities, community centers, state and local health departments, schools, workplaces, patients’ homes, and more. It is imperative that these programs continue to thrive and provide support for institutions that educate and train our future nursing workforce to meet our nation’s growing demand for healthcare services,” Weiner said. The AANA also is concerned about the addendum to the president’s budget which recommends cutting the National Institute of Nursing Research (NINR) by approximately $3 million, a decrease of 2 percent. Heating, cooling, and ventilation are in accordance with ASHRAE 170. Medical supply and equipment manufacturers’ instructions are considered before reducing humidity levels to those allowed by ASHRAE. Existing smoke control systems automatically vent smoke, prevent the recirculation of smoke originating within the surgical suite, and prevent the circulation of smoke entering the system intake, without interfering with exhaust function. New occupancies have no smoke control requirement. For most CRNAs who recertified or initially certified in 2016 on or before July 31, the deadline to complete their quick two-year check-in is July 31, 2018. More than 80 percent of all CRNAs due to complete this next step in the CPC Program have already done so. Don’t wait—only days remain before the July 31 deadline. Complete your Check-in here: http://portal.nbcrna.com. Not sure of your deadline? See the chart on www.nbcrna.com/2YCI. Not sure when you recertified? 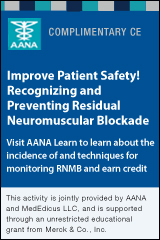 Click "verify credential" in the top right corner of the NBCRNA website www.nbcrna.com. If you’ve already checked-in or are not due to recertify this year, remind your colleagues. In July 2018, the AANA Board of Directors approved a modernized Code of Ethics for the Certified Registered Nurse Anesthetist. This code establishes the ethical standards for the nurse anesthesia profession and guides the Certified Registered Nurse Anesthetist (CRNA) in ethical analysis and decision making in daily nurse anesthesia practice. The AANA has created a new Code of Ethics for the CRNA: Overview and Resources Webpage to post relevant information, resources, and AANA Journal articles related to the topic of ethics and nurse anesthesia practice. The Association of periOperative Registered Nurses (AORN) Guideline for Surgical Attire is currently out for open comment. This document provides guidance to perioperative team members for laundering surgical attire; wearing long sleeves, cover apparel, head coverings, and shoes in semi-restricted and restricted areas; and cleaning of identification badges, stethoscopes, and personal items such as backpacks, briefcases, cell phones, and electronic tablets. CRNAs are encouraged to review and leave professional, diplomatic, and concise comments directly on the AORN site. Note, non-AORN members will be asked to create a free account in order to be able to submit comments. A dedicated AANA member webpage (login required) has been created where updates will be posted on the work of the Full Scope of Practice Competency Task Force (FSOPCTF). Members can currently view a summary of the FSOPCTF Dec 15-16, 2018 meeting, held at AANA headquarters. This webpage also contains a comment form, where members can provide the FSOPCTF with feedback any time throughout this process. The task force looks forward to hearing from members as they continue this important work. Former AANA President Sharon Pearce, MSN, CRNA, and CRNA Financial Planning's Jeremy Stanley, CFP, AIF, have launched a series of podcasts called Beyond the Mask. It can be found here and on iTunes. Episode #7 (January 3, 2019) with Patrick Ballantine, who has served in the North Carolina state senate, discusses CRNAs and the Legislature. Ballantine is currently a lobbyist for the North Carolina Association of Nurse Anesthetists (NCANA), and talks about what kinds of conversations are happening on the legislative level and how you can get involved in making sure CRNA interests are represented in government. The AANA prepared fact sheets that provide an overview of the 2019 updates to the MIPS performance measure categories, which CMS published in the Physician Fee Schedule Final Rule in November 2018. The updates include revised performance measure category reporting requirements, and the scoring weights attributed to each category. The fact sheets are available through the Quality and Reimbursement website on January 4, 2019. As a former president of the AANA, I am honored to have been selected as leader of the CRNA Delegation to the Republic of Croatia. I invite you to join me in this important international exchange. In conjunction with World Learning, a U.S.-based nonprofit organization, this delegation has been developed to foster one-on-one dialogue with our overseas counterparts. Our delegation will continue World Learning's 85-year legacy of advancing leadership through engaging citizens and forming networks between the U.S. and international colleagues. This delegation will convene in Zagreb, Croatia, in May 2019. I believe you would contribute valued expertise to the team while gaining both personally and professionally from the experience. The CRNA Delegation will meet with practicing nurse anesthetists and surgical teams to discuss their methods and experiences implementing programs designed by international experts to address shared challenges in healthcare delivery. The professional delegation will convene in Zagreb, Croatia, on May 18, 2019, and conclude in the coastal city of Rijeka on May 24, 2019. The interactions, site visits, and experiences have been designed to enhance our appreciation for this unique Eastern European country and the diverse populations that define this part of the world. See the Preliminary Schedule of Activities for an outline of our planned professional opportunities and cultural experiences. For more information regarding the region's history as well as program details including cost and application process, check out the AANA Delegation pamphlet. To apply to join me on this rare journey, please go to the World Learning Professional Exchanges page. I am pleased to be involved in this exciting opportunity, and I hope you will consider participating in this unique event. In the meantime, please feel free to contact me or World Learning with any questions. Doing Work Outside of Your Primary Job? The American Journal of Nursing has released the winners of its Book of the Year Awards 2018. In the category of Nurse Managing and Leadership, the number one book is Health Policy and Advanced Practice Nursing: Impact and Implications, which features CRNA authors — current AANA President Garry Brydges, DNP, MBA, CRNA, ACNP-BC, FAAN, and former AANA President Christine Zambricki, DNAP, MS, CRNA, FAAN. Brydges, along with Cynthia Abarado, Kelly Brassil and Joyce E. Dains, authored a chapter titled, "Health Policy Implication for APRNs Related to Oncology Care." Zambricki's chapter is titled, "Health Care Policy and Certified Registered Nurse Anesthetists: Past, Present and Future." Former AANA Professional Relations Specialist Maureen Shekleton, PhD, RN, FAAN, also authored a chapter with Melinda Ray titled, "Coalition for Patients' Rights: A Coalition that Advocates for Scope of Practice Issues." Corey Johnson, MAE, CRNA, ARNP, spoke with a local newspaper about a new procedure at Pullman Regional Hospital in Pullman, Wash., that helps patients reduce pain without opioids. The procedure is called radiofrequency ablation, takes about 30 minutes, and is performed while the patient is under deep sedation. "The radiofrequency ablation procedure involves radio waves," says Johnson, "which create heat that disrupts the sensory nerves of a certain part of the body, such as the knee or hip." The Webster University 2019 Faculty Research Grant recipients include Vicki Coopmans, CRNA, for her research on "Platelet Release of 5-Hydroxytryptamine with Exposure to Amniotic Fluid: An Investigation Into the Pathyphysiologic Mechanism of Amniotic Fluid Embolism." Coopmans is one of 24 recipients. Read more. Think you're in pretty good shape? Meet Pauline Horn, CRNA, whose physical therapist suggested she begin strength training, never imagining she'd become a competitive powerlifter. "At 76, Ms. Horn turns heads in the gym when she deadlifts 185 pounds five times in a row," reports the Wall Street Journal. Read more. The Illinois Association of Nurse Anesthetists began its National CRNA Week (January 20-26, 2019) campaign early, with a very visible billboard on one of Chicago's busiest highways, and featuring its CRNAs in a local suburban newspaper. They also posted a calendar of events for the entire month of January. The Daily Herald featured a story titled "Nurse Anesthetists: Always There, Caring for Illinois Since 1880," which combined nurse anesthesia history with quotes and descriptions of what CRNAs do, who they are and how they have served the state. Read more. It is AANA's pleasure to introduce a new AANA Member Advantage Partner, Hagan Barron Intermediaries (HBI). HBI will be managing the group disability and other group insurance offerings through the Member Advantage Program as our official broker on record. HBI is an industry leader in the administration and marketing of insurance programs for professionals. HBI is committed to the AANA and our members, providing an exceptional customer experience. To learn more, visit: myaanainsurance.com. You are invited to be a part of the Mayo Clinic legacy where CRNAs are essential anesthesia care providers within our multidisciplinary integrated group practice. The CRNA role is deeply embedded in the Mayo Clinic practice with Mayo’s nurse anesthesia program being the oldest continually operating program in the country. As a CRNA at Mayo Clinic, you will be a part of a world renowned surgical and procedural environment that presents opportunities that may rarely be experienced elsewhere. As our surgical and procedural practices grow, we invite you to join our diverse team as we provide health, hope, and healing to people from all walks of life. Learn more. Through a cross-sectional analysis of more than 2.6 million women who gave birth in 2015, researchers have confirmed a suspected uneven pattern of neuraxial labor analgesia use from state to state. The technique is considered the gold standard for pain relief during labor, and results from this retrospective investigation show that it was indeed used by 73.1 percent of the study population. However, usage varied widely, ranging from a prevalence rate of just 36.6 percent in Maine to 80 percent utilization in Nevada. Only a small portion of the variation, 5.4 percent, was explained by U.S. states, with unmeasured patient-level and hospital-level factors likely accounting for the bulk of the discrepancy. The researchers recommend further study to determine the primary reasons behind the variation in practice, as well as whether it has an impact on maternal or perinatal outcomes. From "United States State-Level Variation in the Use of Neuraxial Analgesia During Labor for Pregnant Women"
JAMA Network Open (12/28/18) Vol. 1, No. 8 Butwick, Alexander J.; Bentley, Jason; Wong, Cynthia A.; et al. New manufacturer data reflect acceptable tolerance with the new sufentanil sublingual tablet (SST), approved by the Food and Drug administration late last year. The finding comes from a pooled analysis of relevant clinical trials where Dsuvia was administered to patients dealing with moderate-to-severe acute pain after surgery or in an emergency room situation. In a report appearing in Pain Management, the study authors note that most adverse events associated with SST—including nausea, vomiting, and headache—were mild or moderate in nature. Moreover, the researchers say, "SST 15 mcg was calculated to be equal to approximately 2.5 mg I.V. morphine based on drug utilization in each treatment group" in the first five hours after treatment initiation. Dsuvia, manufactured by AcelRx, is indicated for the management of acute pain in adults only when the pain is severe enough to require opioids, when other treatments are insufficient, and when administered in a certified medically supervised healthcare setting. From "Sufentanil Sublingual Tablet Well-Tolerated, According to Pooled Safety Data"
Results are in from a prospective study that examined pain relief with ilioinguinal/iliohypogastric (IINB) compared with transversus abdominis plane (TAP) block after open inguinal hernia repair. Research partners from the University of Buffalo in New York and Iran University of Medical Sciences in Tehran randomized 45 participants recovering from the procedure in the post-anesthesia care unit to IINB and the same number to TAP block, all under ultrasound guidance. Numeric Rating Scale scores were lower for the IINB recipients both at rest and during movement at 24, 36, and 48 hours postoperatively. Analgesic satisfaction levels, meanwhile, were much higher in the IINB group than in the TAP block group. The findings point to superior analgesia from IINB versus TAP block in patients who have undergone open repair of inguinal hernia. From "A Clinical Trial Comparing Ilioinguinal/Iliohypogastric Nerve Block to TAP Block Following Open Inguinal Hernia Repair"
Journal of Pain Research (01/19) Vol. 2019, No. 12, P. 201 Hamid Reza Faiz, Seyed; Nader, Nader D.; Niknejadi, Soraya; et al. New evidence suggests that intravenous ketamine could help patients with treatment-resistant depression, regardless of whether their condition is anxious or nonanxious in nature. Harvard Medical School's Naji Salloum, MD, led the pilot study, which involved secondary analyses of data from a recent trial that compared outcomes with IV ketamine relative to midazolam. The primary investigation found ketamine to be the more effective agent, but Salloum and colleagues were interested in stratifying responses based on anxious versus nonanxious depression. Although the 45 study participants with anxious depression had a lower level of disassociative symptoms 40 minutes post-infusion, the change from baseline on several disease rating scales was similar to that of patients with nonanxious depression one and three days after treatment. "Our data suggest that patients with anxious depression respond equally as well to ketamine compared to those with nonanxious depression," the team wrote in Depression & Anxiety. "The exact mechanism behind the differential response to ketamine versus other conventional antidepressants in anxious depression remains unclear. These results are still exploratory and future larger and adequately powered studies designed to specifically test this aim are warranted." From "Ketamine Shows Potential in Anxious Treatment-Resistant Depression"
The Pain Management Best Practices Inter-Agency Task Force, created in 2016, has come up with a list of recommendations for improving pain care in the United States. According to the panel's 29 expert members, pain management should be individualized, balanced between pharmacological and nonpharmacological solutions, multidisciplinary, and multi-modal. They also emphasize the importance of addressing the needs of special populations, including children, women, older adults, and current and former service members. A draft report on the recommendations shuns "chronic pain" as an inadequate term that often fails to capture problems that may be exacerbated by surgery or other medical catalysts, for example, or characterized by flares from an underlying disease or injury. At the same time, panelists include a slate of conditions—from cancer and multiple sclerosis to lupus and cluster headaches—that can be included under the new category of "chronic relapsing pain conditions." Additionally, the draft report touches on the risks associated with concomitant opioid and benzodiazepine use, the relationship between drug shortages and poor-quality pain care, and opioid prescribing guidelines. The task force will accept public feedback on its draft report during a 90-day comment period, after which the report will be finalized and submitted to Congress. From "Fed Panel Releases Draft Report on Pain Management"
A meta-analysis compared general anesthesia maintenance with propofol versus inhalational agents, with postoperative nausea and vomiting (PONV) as the primary outcome. A total of 229 randomized controlled trials were included, for a collective sample of nearly 21,000 patients. The risk of PONV was lower with propofol, which also was associated with reduced pain scores after extubation and less time in the post-anesthesia care unit. While it took longer for the propofol patients to achieve respiratory recovery and tracheal extubation, their patient satisfaction scores were still higher than their counterparts on inhalational agents for anesthesia maintenance. Despite the apparent benefits of propofol in this setting, the researchers say adequately powered prospective clinical trials are needed to identify the clinical and economic implications of their results, which are reported in BMC Anesthesiology.